Click above to see a larger image. Source: Office of Mayor Antonio Villaraigosa. 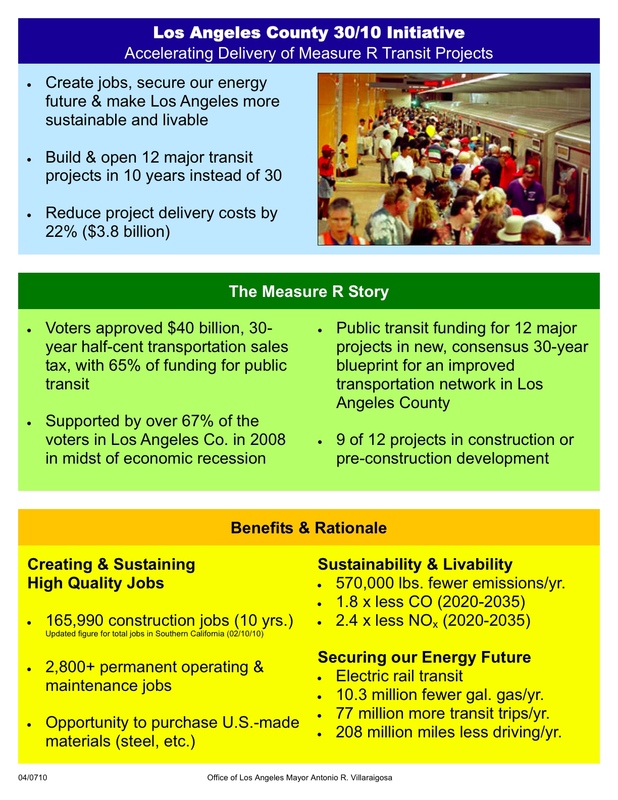 As expected, Los Angeles Mayor Antonio Villaraigosa’s 30/10 initiative to build a dozen Measure R transit projects in the next decade instead of the next three decades will be considered this month by the Metropolitan Transportation Authority Board of Directors. The 30/10 initiative will go before the Board of Directors beginning Wednesday in the planning committee and then later in the day in the finance and budget committee. Here is a link to a prior post on the mayor’s plan. 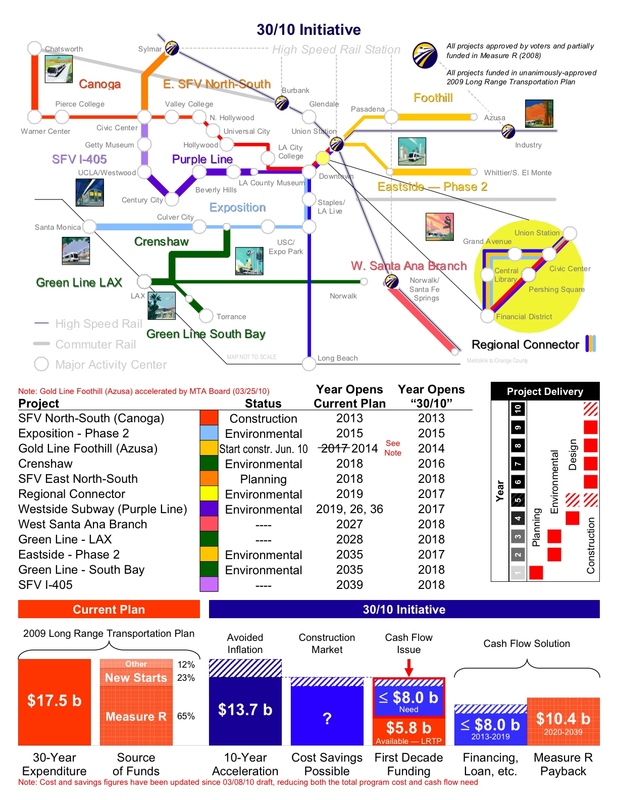 The 12 transit projects — listed in the graphic at the right — have major funding from Measure R and their sequencing was set in the long-range plan adopted by the agency’s Board of Directors last fall. The initiative hopes to secure federal support via interest rate subsidies, direct loans, creative financing terms or loan guarantees. A vote by the Board that it supports 30/10 would demonstrate to the federal government that the plan has been embraced by officials across Los Angeles County. In the past, the feds have wanted to see widespread support for transit projects before they will consider funding them — the exact reason that last year’s Board vote on a long-range plan was significant. Among the issues likely to be discussed by the Board of Directors are the projects included in the mayor’s plan and Metro’s ability to operate a dozen new or expanded transit lines if, in fact, they are built and open in the next decade. The Board of Directors are also likely to ask about the issue of accelerating highway projects. The mayor’s 30/10 plan has received considerable attention in the press in the past couple of months and Villaraigosa recently traveled to Washington to lobby officials — as did officials from the Los Angeles Area Chamber of Commerce, the activist group Move LA and labor leaders. Both of California’s senators, Dianne Feinstein and Barbara Boxer, have indicated support and U.S. Transportation Secretary Ray LaHood has also shown interest. The first page of a fact sheet on the initiative that is being circulated by the mayor’s office is posted after the jump.